Lemon Balm (Melissa Officinalis) other names: Balm, Bálsamo de Limón, Cure-All, Dropsy Plant, Honey Plant, Melisa, Melissa, Melissa officinalis, Melissae Folium, Mélisse, Mélisse Citronnelle, Mélisse Officinale, Melissenblatt, Monarde, Sweet Balm, Sweet Mary, Toronjil. The plant commonly known as the lemon balm is so called because it has the scent of lemons, it belong to the genus Melissa, species officinalis, of the mint family Lamiaceae. Lemon balm is a hardy perennial plant that was traditionally used and preferred by the bee keepers in ancient eras. The ancient bee keepers used the crushed leaves of the plant as a rub on beehives so as to encourage the domesticated bees to return to their hives and the belief was that these bees would bring other bees along with them when they returned. The Greek word (melissa) for bee gives the plant its generic name. The lemon balm is also known by another common name in Europe - "bee balm", thus the association of this plant with bees has a long history of usage. Morphologically the lemon balm is an upright plant; it has hairy and branching stems that can reach a yard in height when fully grown. The herb also bears many light green colored and toothed ovate leaves which grow out in opposite pairs at each joint along the entire stem. From the month of June through September, white or yellowish two-lipped flowers appear on the branches and form along in small loose bunches located on the axis of the leaves - these floral outgrowths emit a strong lemony scent and give the plant its common name. The lemon balm is originally a native plant seen in areas of southern Europe, in parts of western Asia, as well as in northern Africa. Due to transplantation for horticulture, the lemon balm is now found around the world and grows successfully in many places. Humus rich, moist and well-drained soils which are slightly acidic or slightly alkaline form the best soils for growing the lemon balm. The plant tolerates a pH range from 4.5 to 7.6 and grows best between these ranges. While growing the lemon balm generally prefers exposure to full sunlight, but it also tends to grow well in partially shaded areas. The lemon balm remedy can also relaxes spasms that cause period pain in the reproductive system of women, these remedies can also bring relief from excessive irritability and depression related to PMS and other conditions. The remedies made from the lemon balm are also very useful as an aid in regulating menstrual periods and have found traditional use in relaxing and strengthening women during the process of childbirth and in bringing on the afterbirth. The lemon balm remedy can help bring relief from depression that occurs postnatal as well as the one that comes during menopause. The lemon balm herb has a relaxant effect, which can help in bringing relief from pain and spasms in the kidneys as well as in the general urinary system of a patient. The remedies made from the lemon balm are also excellent for the treatment of headaches, as well as problems such as migraine, problems like vertigo and buzzing sensations that occur in the ears. The lemon balm combined with the linden flowers helps in reducing elevated blood pressure in the body. The lemon balm when taken in the form of a hot infusion can induce sweating in the body, this helps in reducing fevers and makes it a very good remedy for many childhood infections, such as colds and flu, as well as various coughs and catarrh which tends to affect children. 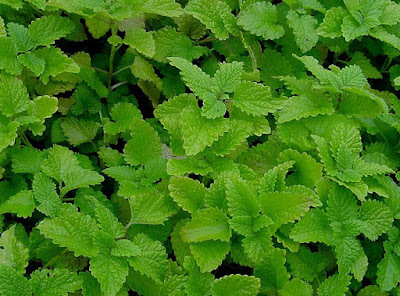 The lemon balm also has potent action as a relaxant and possesses mucous reducing properties, these powers are very helpful during cases of acute and chronic bronchitis, they are also helpful in treating harsh and irritating coughs as well as asthma in patients. The remedies made from the lemon balm are also excellent in treating allergies and the potent antiviral action of the herb makes it very excellent for the treatment of cold sores in patients. People with an overactive thyroid are also given the lemon balm remedy following the discovery of its potent anti-thyroid activity. The lemon balm is also used in many culinary preparations and cuisines in Europe. 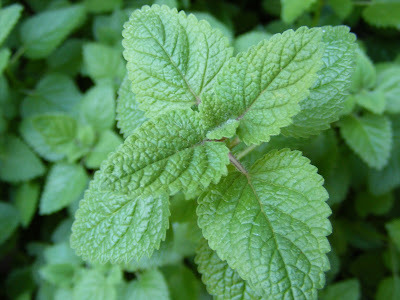 The fresh or dried lemon balm leaves can be added to green salads, to sandwiches, as well as to marinades and sauces, to vegetable soups and stews. It can also be used as a stuffing for pork, for veal, or for poultry, lemon balm can be used in dishes of vegetables, in many kinds of egg dishes, as well as in jams and jellies, and also in the preparation of herbal vinegar - especially the tarragon vinegar. The lemon balm has a rather delicate taste, and when using, use as much as you need and more in quantity then the other robust or pungent culinary herbs normally used in culinary preparations. The fresh leaves of the lemon balm can be initially crushed for them to release the lemony flavor inside before they are used in the various dishes. A refreshing herbal tea may be made by pouring some scalding boiling water over a bunch of fresh crushed lemon balm leaves. This must be steeped in the hot water for a few minutes in order to allow the herb to diffuse into the water. The herbal tea can be sweetened with some honey or some sugar can be added for taste before it is consumed. The crushed lemon balm leaves can also be added to summer punches and soft drinks to enhance the taste of such drinks. Many liqueurs can be fortified and flavored by adding the lemon balm oil, for example Chartreuse and Benedictine can be flavored in this way. Lemon balm is likely safe when used in food amounts. It’s possibly safe in adults when used in medicinal amounts short-term. It’s been used safely in research for up to four months. Not enough is known about the safety of lemon balm when used long-term. Some information suggests that lemon balm might be safe when taken in appropriate amounts by infants for up to a week and by older children under age 12 for up to one month. When taken by mouth, lemon balm can cause some side effects including nausea, vomiting, abdominal pain, dizziness, and wheezing. When applied to the skin, there is one report of irritation and one report of increased cold sore symptoms. Children : Lemon balm is possibly safe when taken appropriately by mouth for short periods of time.